Many outsiders think this tradition is painfully awkward. Or worse, idolatrous. When people visit the Russian church, many are horrified when they see the old and young kissing the right hand of the priest. But like so many other things that seem bizarre from the outside, its actually an incredibly simple and natural element of the Russian Christian environment. Russians (as well as other Orthodox Christians) do indeed kiss the right hand of the priest when they greet or bid farewell to them, calmly and unabashedly. Shaking hands with a priest, though, is considered disrespectful or simply misplaced. The biggest problem people have with this tradition is that they think that the tradition is idolatrous. In other words, that by kissing the hands of the priests, the Orthodox Christians are worshipping humans, as though they were gods. In actuality, this is both an over-simplification and an over-complication. 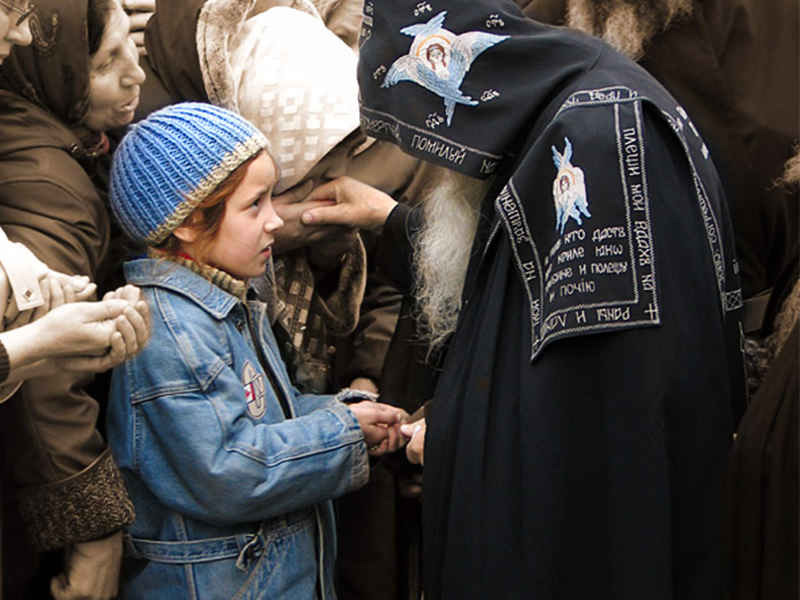 When believers kiss the priest's hand, they are offering love and reverence to the Christ, whom the priest mystically represents, not to the sinful human himself. The kissing of the hand of the priest is not about the man, but rather about Christ. It is much like the kissing of an icon, which is not about the veneration of paint and wood, but about the archetype represented in the icon. When we kiss the hand of the bishop or priest, we are not showing respect to the person of the priest but to his sacred office. The priest, representing Christ, is a living icon of Christ. Though he be a sinner who is unworthy in and of himself of such respect, that he touches the Most Holy Things - the Precious Body and Blood of the Lord, makes the kiss, in actuality, an honor extended to Christ Himself. Through ordination the priest has received the Grace of God to impart spiritual gifts and blessings, so we should not deprive ourselves of these blessings by refusing to kiss the priest's hand. We should show this respect and receive this blessing whenever we greet, or bid farewell, our spiritual authorities. There is the true story of a priest pulling away his hand in order to prevent Czar Nicholas II from kissing his hand. The Emperor ordered him to extend it, saying "I am not kissing your hand, but the hand of Christ". In refusing to allow anyone to kiss his hand, any priest, who out of false humility would deprive a pious Christian the opportunity to kiss his hand, deprives the person of Christ's blessing. Besides, not so long ago, kissing the hands of one's elders was considered perfectly normal; a sign of respect and reverence for one's elders. It was an explicit, loving acknowledgement of another's authority over us or a testament to their important, revered position in our lives. The disappearance of this custom is part of the disintegration of traditional Christian society, which was based on hierarchy, humility, and respect. And based, of course, on love, which does not exist without respect. And for those who think this sign of respect and veneration is demeaning, it’s called Humility.